Anna Sui’s collections take you on a creative journey that is unparalleled in the world of fashion. Mixing vintage styles with her current cultural obsessions, she effortlessly makes hip and exuberant original clothes. Anna Sui has 50 boutiques in eight countries and her collection is sold in over 300 stores in over 30 countries. The Anna Sui brand also includes her very popular fragrance portfolio. Sweet and feminine with a bit of nostalgia, all of Anna Sui’s fragrances are mixed with the hip, trendy touch of rock-and-roll coolness. Each fragrance represents a journey through magical fantasy worlds. They tell colourful stories of wishes, fairies, rock stars, princesses and exotic travel. 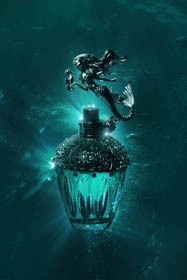 The gorgeous bottle designs are highly collectible; the personification of everything she believes in, a fantasy of the exotic past and a dream for a romantic future.